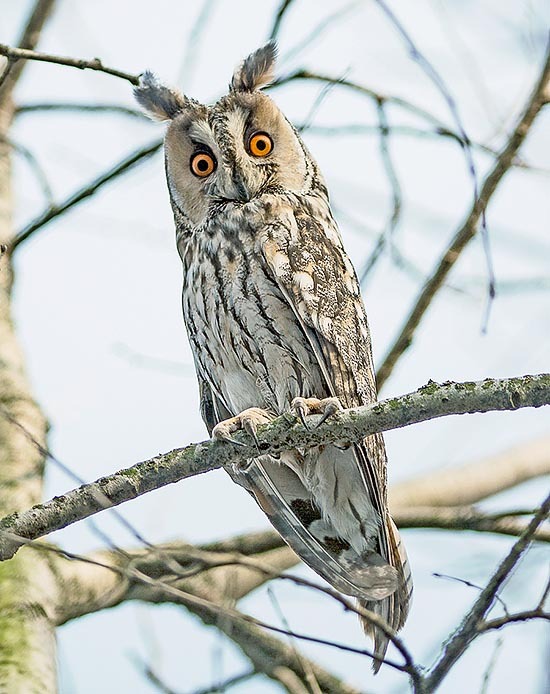 The long-eared Owl (Asio otus Linnaeus, 1758) belongs to the order of the Strigiformes and to the Strigidae family and together with the Little Owl (Athene noctua) is one of the most familiar nocturnal birds of the European world. It is a strictly nocturnal bird and can be seen only during its patrolling in the pitch dark when, caught in the headlights of our car, suddenly crosses the road with its elegant and soft flight. Its flight is absolutely noiseless as its primaries are fitted with tiny barbules and fringed on the outer side of the feathers that reduce the noise caused by the wing beat, letting it to get at the prey absolutely unexpected. Perhaps we know it better for its mournful song that persistently utters during springtime nights or better still, when during the winter we find it out unexpectedly perched on the pinetree in our garden that looks at us wringing its head e following us in our movements without the slightest fear. This last behaviour, fairly common, sometimes sees a good number of birds gather together on the same tree to spend the day and all the winter. During this season they are not scared of the presence of human beings and often find shelter on trees, usually conifer, very close to our houses. A behaviour probably adopted to better protection against possible attackers but also for the climate temperature which is warmer within human settlements. Some trees are chosen year after year as if the knowledge of the place is transferred genetically from parents to sons. However it is a bird that usually lives in thick woodlands and well wooded areas where it spends the main parts of its life and only in some particular cases it moves closer to human settlements. Long-eared Owl entered since centuries in our customs and in our way of saying for wisdom, for which it has been pointed and for its deep and careful look. Literature places it at this level and proverbs, tales and legends extend more its curriculum as well. Walt Disney movies have chosen it as pet for several cartoon pictures even if sometimes it has been misrepresented as a mournful bird that stood by witches but immediately redeemed at first opportunity. Indeed it stares at you with its huge round eyes, looking at you deeply as if it could extort you some secret or as it would reassure you of its harmlessness, raising its ear tufts and stretching its body till to become as long as the branch on which it is perched but it is only to hide itself and try to be unnoticed. Moreover it is a very useful bird for humans, since it is a smart hunter of small rodents so harmful to agriculture. 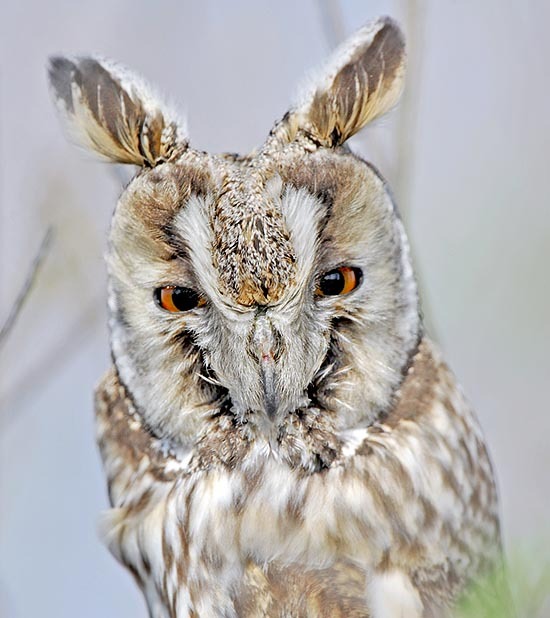 Its scientific name Asio comes after ancient Greek from the omonimous word that identifies a small Owl and otus from “otos” = ears, for the long ear tufts. Equally interesting are the common names almost all referred to its size always compared to its greater cousin, the Eagle Owl (Bubo bubo). Hibou moyen-duc – in French, Búho chico – in Spanish, Coruja-pequena or Bufo/Mocho pequeno – in Portoguese, Waldohreule – in German and Gufo comune – in Italian. 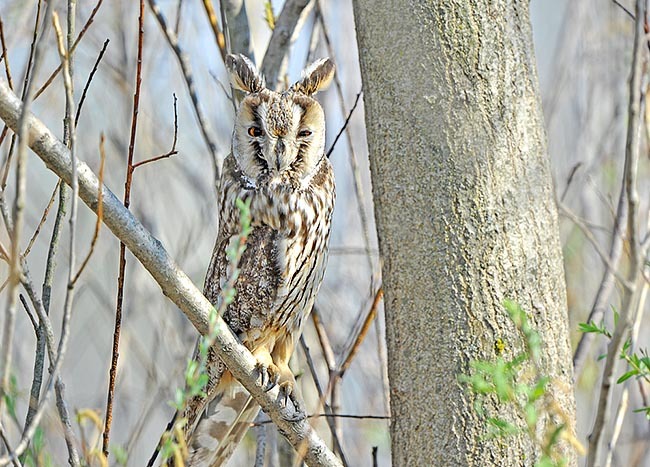 The long-eared Owl is widespread in Europe, in Asia and in North America. It is a species that lives in the temperate bend of the north emisphere and rarely descend on tropical latitudes. There are some colonies in Morocco, Canary and Azores Islands but its territory has not changed since centuries. Tundra is its northern limit but it limits to south as well, when woodland area, its essential habitat, are not available. It is a widely resident bird even if population of the most northern areas migrates for some hundreds kilometers south to spend the bad season but essentially this is provoked by the temporary lack of preys in areas hit by biting cold. Also in the Mediterranean area we notice such a movements even for short distance but mainly due to descend from higher altitude towards lower areas and to snow cover. Considered the very wide diffusion area, 4 subspecies have been classified and well limited in their territories. Asio otus otus typical of Europe, of Morocco, Middle East and Asia as far as Pacific coasts; Asio otus canariensis of the Canary Island; Asio otus tuftsi located in the western area of Northern America and the Asio otus wilsonianus in the central-western side of North American Continent. The long-eared Owl is a bird that during nesting period lives mainly in woodland areas, in conifer forests, in parks with big trees covered by clinging ivy but it does not despise choosing sites close to human settlements when the nesting period is over. It does not like to go over 2500 m altitude. During hunting phases and in any period of the year, it however approaches human settlements as its usual preys often depends on human being presence. It hunts mainly mice and moles but it does not disdain insects, frogs and small mammals. It is also clever to prey small birds caught when sleeping on branches during the night. It regularly throws up roundish and well thick droppings that often are the only sign of its presence. It regularly throws up roundish and well thick droppings that often are the only sign of its presence. It has a very strong hearing due to the amplification supplied by its facial disc that creates a concave oval that concentrates the sound perceived but also by the two ear holes that are slightly misaligned as to allow to detach the origin of the sound with a lethal precision. Ear tufts have no auditory function. Strigids cannot move the eyes inside the socket but nature helps them giving the ability to turn their head of close 270° with a view practically complete of what is around. The long-eared Owl has a wingspan of close 100 cms, a lenght of 35 cms and a weight of 250 g. Weight varies remarkably during the different seasons, according to food availability, therefore during winter period you can often find birds extremely skinny but it seems that this situation is a usual feature of night raptors and it is tolerated without any particular troubles if not extended for very long periods. Female is slightly heavier. Feathering is very camouflaged and show the presence on all the body of grey, brown and yellow ochre blot, regularly scattered on all the plumage. Perched close to the tree trunk or soaked in the thick of an evergreen or dried clinging ivy, this bird becomes absolutely invisible. On the contrary, invisibility becomes impossible during the winter season when it chooses accidentally as a roosting place, trees completely bare on which to spend the day. 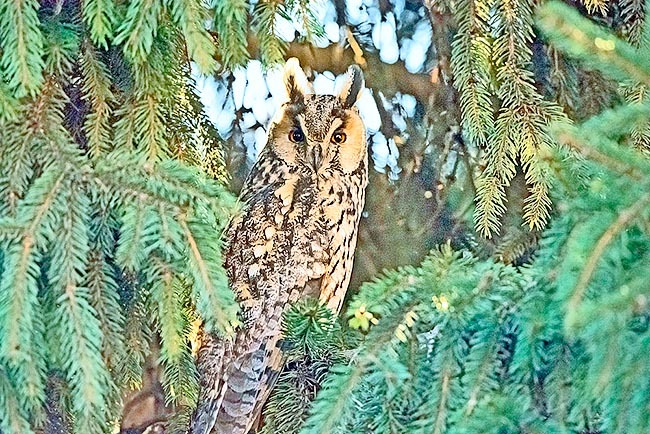 Nevertheless the long-eared Owl considers this camouflage effective and strong of this conviction, here it stretches again its body, it raises the ear tufts, it leans to the trunk and thinks again to be invisible. The underwing is much more light and includes the primaries, unlike its congeneric Short-eared Owl (Asio flammeus) that has these feathers totally black. In fact our Owl could be easily confused with this bird only for this detail, for the absence of evident ear tufts, for the different colour of the eyes and because the short-eared Owl is mainly terricolous choosing the ground both for roosting and nesting whilst the long-eared one is typically arboreal. 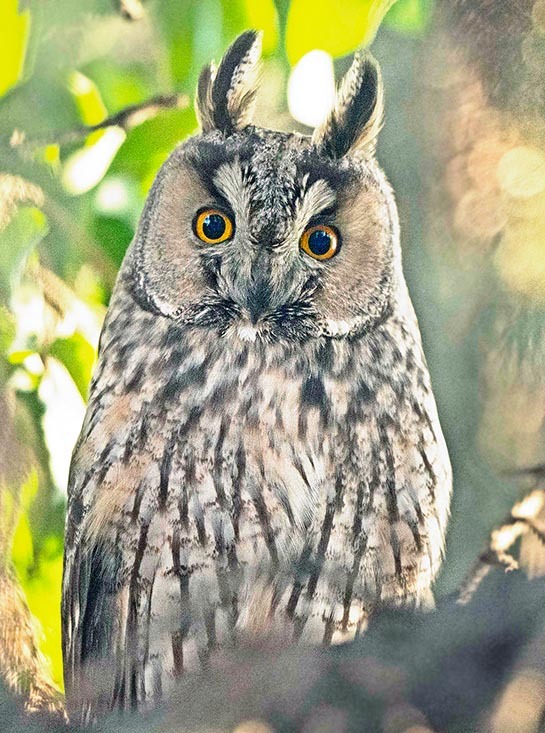 The long-eared Owl has bright eyes of beautiful orange colour, while are yellow for the short-eared, that opens wide in excessive way when it feels to be observed and for sure this pecualiarity has titled it as a wise and careful bird. Female shows colours and shade more evident while immatures which are very similar to adults, have a slight colouring. Long-eared Owl in some periods is very prolific since it can nest even twice in the same year according to strong preys availability. Besides it lays a good number of eggs for any clutch till 7, succeeding in some good season to breed a descent of almost a dozen of nestlings. Eggs are very white and, as usual for strigids, particularly rounded. This Owl does not prepare its own nest but usually encroach those of crows and sometimes those of squirrels, simply using the layer found inside and slightly refurbishing bringing some soft branches, without modifying the main structure. Sometimes when not available, it accepts to lay eggs on the ground under a low bush or among the roots of a tree, keeping the position uninterruptedly to avoid predation by small terrestrial predators. Male brings food to female during all the brooding period and also in the first days of life of the nestlings. Female is very shy and steady during brooding therefore is possible to get very close without particular fear. Though it lays curl up on the bottom of the nest as to disappear, it is easy to notice its presence looking at the two long ear tufts that suddenly drifts at the arrival of outsiders, the only little signs that betray its presence. When it feels discovered suddenly it applies a particular defense technique. It enlarges wings swelling as to appear bigger than reality and sometimes it jumps from the nest imitating a wounded bird to lead the attacker afar. Sometimes winter behavior which lead them to gather in large number on common roosting site, continues up to the nesting period forming scattered colonies of several pairs. Brooding lasts in 4 weeks and nestlings stay in the nest for further 5 but usually youngs leave it earlier moving around and hiding among bushes and consequently reducing the risk of a full brood predation. Youngs follow mother’s behavior swelling as to appear two or three times bigger than reality thus to defend themselves. Since it lays eggs with some days interval, nestlings have consequently sizes and ages very different. Pair is monogamous during nesting period even if partner is usually changed every year. This Owl is also known for the monotonous but melodious song that utters repeatedly. At times it repeats for hundreds time the typical and slotted hoo hoo hoo hoo that fills up the nights of our woodlands. In other periods it keeps silent and utters alarm squeak only at times. This strigid reaches sexual maturity at first year and is enough long-lived, since it has overcome in some cases even 20 years of age but usually 10/12 is its natural life span. Long-eared Owl is predated by larger birds of prey both diurnal and nocturnal and by arboreal mammals, particularly during the first two weeks of life when still unarmed in the nest. Besides it is subject to poaching and to car collision during night time. However it is in a good preservation status and is not covered by any particular protection.